October 1st, 2018 – Our president believes that “when you’re a star they let you do it,” and the Hollywood Chamber of Commerce believes that once you receive a star, you can do whatever you want. Following Bill Cosby’s conviction of aggravated indecent assault, his new classification as a “sexually violent predator,” and his sentencing of three to 10 years in a state prison, questions about his star on the Walk of Fame began to pop up. This isn’t the first time protests over his $40,000 block of sidewalk have circulated. 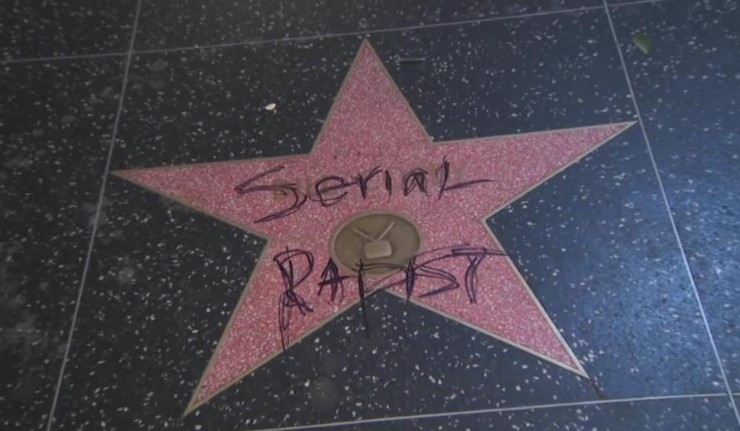 Cosby’s star, just like Trump’s, has been the subject of vandalism since he was first arrested for charges back in December of 2015. 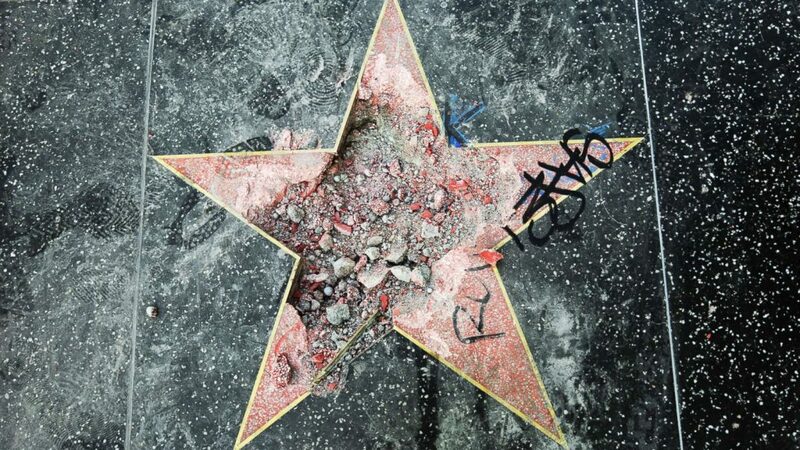 Donald Trump’s star following the swing of a pickaxe in July 2018. The Los Angeles Urban Policy Roundtable is currently in the process of gathering signatures for a petition it plans on handing over to the Hollywood Chamber of Commerce. Despite calls for the star’s removal, the Chamber of Commerce remains adamant that it will stay in place. Arguing that individual stars become part of the larger fabric of the town and only reflect the artist’s professional life, they have no plans to get a pickaxe of their own. I don’t have a perfectly formulated answer for how you can still appreciate an artist’s work after they’ve personally done something horrendous or if you should denounce all they’ve done and what it’s meant to you if they’ve let you down on a personal level. I do know that it’s possible, and that we don’t have to be so coy when we try to discuss the issue. I’ve been way into certain comedians who turn out to not be amazing people apart from their craft. Would I still pay to see them perform today? Probably not. But I can still say that a joke they told years ago helped me laugh at times that were difficult. I can still appreciate something that they shed light on but now find other, more exemplary, people who also explore that topic and support them instead. The Chamber of Commerce said that the Walk of Fame is a “cultural landmark.” Unless you’ve actively shielded yourself from the news, our culture has been changing, albeit slowly, over the past year in how we respond to women who have been victims of assault, harassment, violence, and discrimination. If there was video of Cosby shooting somebody on the Chamber’s board of directors, a line might suddenly appear. They might be able to edit their canned PR statement and recognize that his work can still be celebrated, but his name doesn’t have to be canonized on pavement. His work includes the contributions of many other people who created something that can still have value today. His name includes a conviction as a sexually violent predator. There hasn’t been an explosion of repercussions. There’s been a handful of consequences for men who have assaulted women amid thousands upon thousands of traumatic stories. So I’m gonna go out on a limb and say that a movement probably hasn’t gone “too far” if even a convicted sexually violent predator still has a star on the Hollywood Walk of Fame, because he used to tell funny jokes. The Chamber of Commerce can say that it’s “regrettable when the personal lives of inductees do not measure up to public standards and expectations,” but I think it’s far more regrettable that we don’t demand public institutions raise their own.